During autumn I always find myself grabbing darker lipstick and eyeshadow shades and as I am a nosy person and I like to see what other people have bought, I thought maybe someone would be interested to see what I have been loving so far. I do love all of these nail polishes. The P2 one dries super quickly and stays quite long. The Rimmel one dries super quickly and the matte color gives it a special touch although it doesn't stay put for so long. The H&M polishes are great when you don't want to spend much money on nail polishes. They are a good quality for the price you pay. They take a little bit longer to dry but stays on your nails quite a long time. 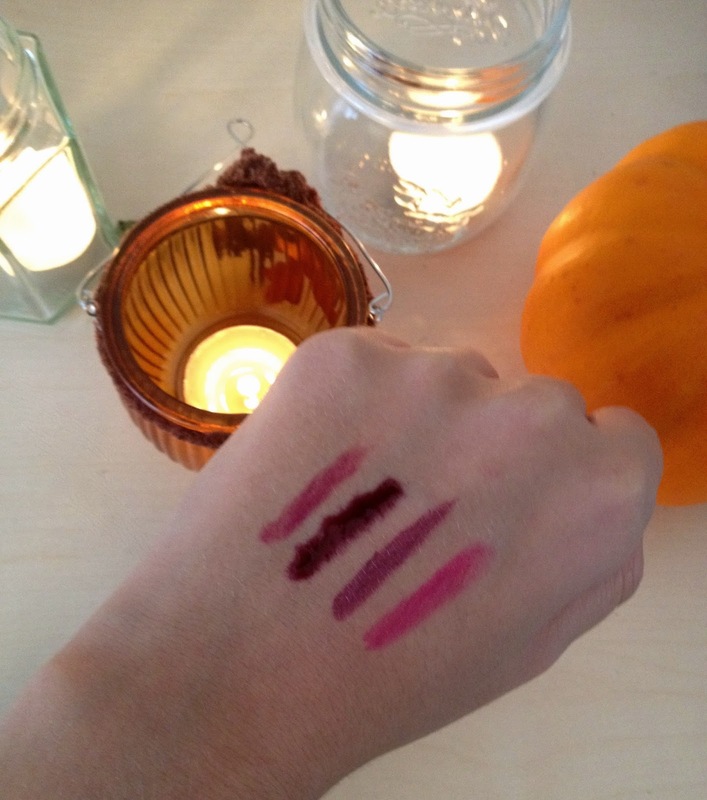 As you may have noticed all of my favorite lipsticks are based around the same color. I love wearing dark, plumy colors when it comes to autumn and winter- wear. I had heard a lot of people raving about the Maybelline Color Elixir so when i first spotted this little bugger in the store I was more than eager to try it. And Maybelline didn't disappoint me. I LOVE this product so much! It has a nice texture and is not too sticky. The color is really pigmented and easily builtable. The Catrice makeup is the one I always find myself going back to. The quality you get is really good and the lipsticks are a real bargain! Great color pigmentation and easy to apply. Only thing that annoys me a bit is that the lipsticks tend to get really dry after a time. The Rimmel one is my favorite one. It's a super pretty dark color. Again great pigmentation and stays where it has to stay and doesn't end up all over your face or clothing instead on your lips. And this lipstick smells amazing! So if you are looking for a nice smelling lipstick check this one out. The Sleek lipgloss/lipgloss is soo sticky which kind of annoys sometimes but on the other hand the lipgloss stays on and on forever. I don't know wether they have mixed in some superglue or they have asked a wizard but basically you don't get this lipgloss away so easily. What I do is because its so sticky I use my finger to apply it on my lips. The Boujois blusher is a really pretty dark browny, purple. Basically this color is autumn. It stays on your cheeks really long and it gives you a super pretty look on your cheeks as if you just would have taken a long walk in the woods. The only thing I don't really like is that it's quite hard to apply it as it's not that pigmented. The Rimmel eyeshadow palett contains every color You need during autumn/winter. It has a glittery gold color, a shimmery purple color, a light brown color, a darker violet color and a dark brown/dark violet color. The colors are super pigmented and really easily to apply and to blend. Basically with this palette you can go for every look you want wether this is dark and smokey or light and natural. Great for traveling as it is a really compact palette. Last but not least the bath bomb! I do have soo many favorites this year and I will make sure to do a post about all my errands in Lush as soon as possible but for this post I selected the most autumnal one. And obviously it's the glittery pumpkin :) This bath bomb is just the cutest! It smells amazing and reminds me of autumn, candles, leaves.. If you want to get into an autumnal/halloween spirit this is a MUST! I love autumn and I think it's over so fast without even noticing, so make the best out of it and try to get into an autumnal spirit everyday and appreciate it everyday. I hope you enjoyed this as much as I loved making this post.